Once in a while a band or singer will come along have a nano second of success and then disappear but leave a something that somehow people remember. In 1982 a band that Kid Jensen on Radio 1 championed and played to death crept into the bottom end of the chart and were not really heard of again, that song was called The River. The band in question was King Trigger who comprised; Martyn Clapson (guitar), Sam Hodgkin (vocals), Stuart Kennedy (bass) and Ian Cleverly (percussion) and the rare sighting of a black female drummer called Trudi Baptiste. Hodgkin and Clapson had both been in a punk band called The Scoop, and soon after, to make ends meet Sam started a clothes stall at London’s Portobello Road market. He was slipped some dustbin liners full of ‘junk’ from a friend in the cleansing trade and sold the contents on his stall. This is where he met Trudi and within a few days were had gone straight into rehearsals and wrote a song called Vodka which was sparked off by an extremely silly TV advert. 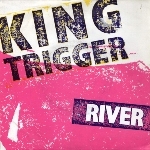 They decided on a new name and were originally called Screaming King Trigger. They tried out a saxophonist but he only lasted a week. Sam recalled, “We also tried out a percussionist who only last one gig at The Venue. I don’t think he hit one thing during the whole show!” Following recording sessions for Peter Powell and Kid Jensen they signed a recording contract with Chrysalis records and toured as the opening act to the Thompson Twins in 1982. Just after they signed, Sounds music paper gave them rave reviews and put them on the front cover of their paper, some thought it reeked of hype and naturally induced suspicion. “We were conscious that people might have thought we were a hype, it must have seemed like a PR exercise,” remembered Martyn. “Sure it was flattering but it was a bit premature.” At the time, Martyn said, “We’ve signed to Chrysalis so people are going to be very cynical about rave reviews and a single out on a major label. I hope that our performances on the Twins tour and in the near future will persuade them that we’re not just a band thrown together by a record company in an attempt to get rich fast.” With Ian’s percussion and Trudi’s tribal drumming it reminded people of that classic Adam & The Ants sound. Their only hit was a spray of words that somehow set the scene of floating down some African river in a dug-out canoe and warning of the dangers of heat, steam, spider’s webs and being careful of the large animals and their man-size bite. Hmmm, the sound was better than the story and the accompanying video is funny featuring an inflatable dinghy, a double barrelled storm water drain, a fat man with his face painted, holding an umbrella and jumping around in his underpants and to top it all, a scantily clad Jamaican woman. They released an album called Screaming which was produced by Steve Lillywhite, it housed their follow-up single release Temptation, but both sunk without trace. Within two years the band had split with each member going their own separate ways. Martyn and his wife Helen moved to Brittany and became hosts to a succession of visitors to their large house in Camlez. Sam became a producer, Ian Cleverly is now the Managing Editor at Rouleur magazine – a publication for cyclists and Trudi returned to her native Grenada where she is now a Dub Poet and the proud manager of The Eco Art Ranch in Snell Hall. In September 2009, Martyn passed away suddenly at the age of 48. Ian paid tribute: Martyn’s humour was cutting but invariably achingly funny. His views on anything and everything were always worth hearing; you may not have agreed with them, but he was always willing to put them up there to be shot down. His intelligence was a joy to be around, and it may have taken me a while to have the confidence to actually contribute to the numerous debates on the burning issues of the day – World peace, the Tory government and whose backing vocals were out of tune. We would meet up every now and then, raise a glass of wine to Martyn, reminisce and laugh ourselves silly, same as we ever did, but we will miss his contribution to the evening’s proceedings dreadfully. Here’s to Martyn, the best friend anyone could ask for.